The Russian coastguard holds Greenpeace activists at gunpoint. 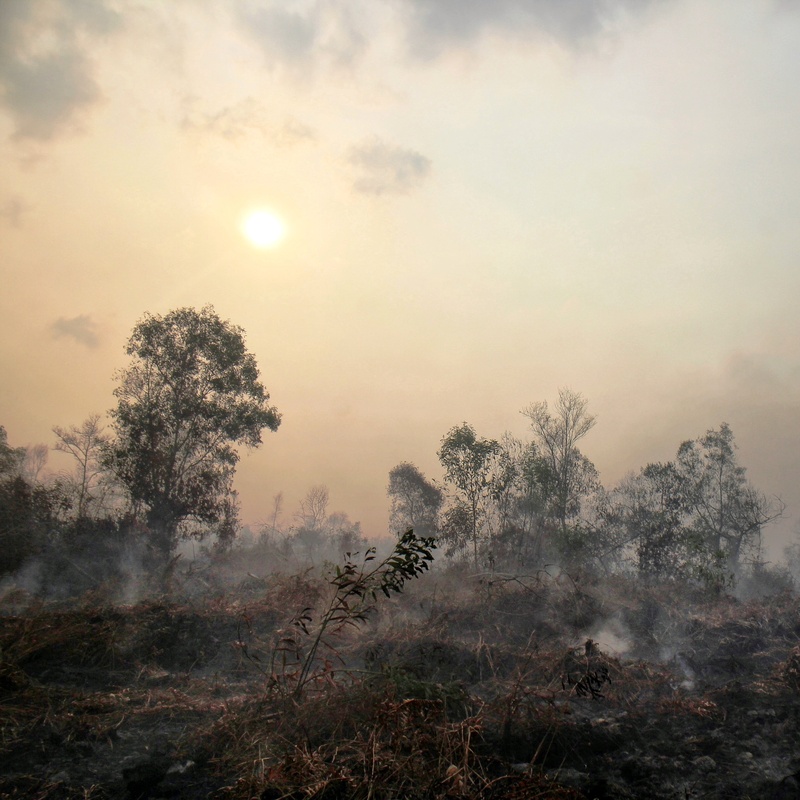 Photo credit: Greenpeace. Thursday afternoon environmental campaign group Greenpeace peaceful protest against Arctic drilling took a violent turn as the Russian coast guard boarded and seized their ship the Arctic Sunrise. According to Greenpeace, this act was a violation of international sea laws as at the time the Arctic Sunrise was in international waters. This act follows events on Wednesday, in which two Greenpeace activists were arrested at gunpoint and withheld without charge in connection with the scaling of Russian gas and oil company’s Gazproms drilling platform. In dramatic scenes, the Russian Coastguards showed up wearing balaclavas and pointing guns and accused the group of terrorism. 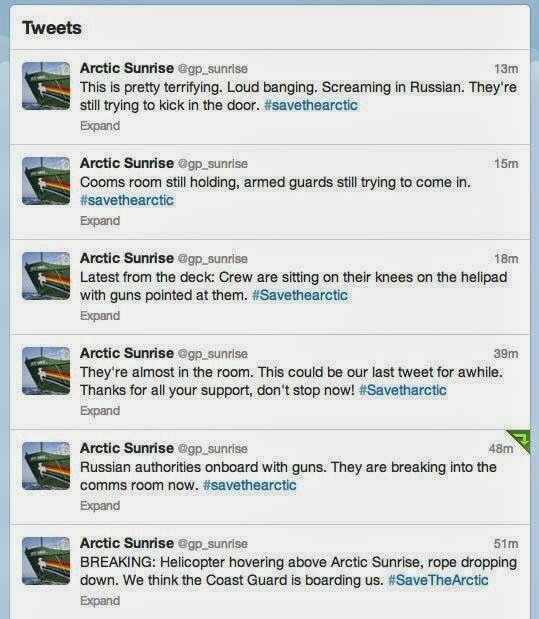 As above tweets illustrate, Thursday events were dramatically reported from the Arctic Sunrise Twitter feed as the ship were being seized. “This illegal boarding of a peaceful protest ship highlights the extreme lengths that the Russian government will go to to keep Gazprom’s dangerous Arctic drilling away from public scrutiny. Even though Greenpeace have conducted their operations peacefully, the Russian foreign ministry accused them of being aggressive and provocative and have summoned the Dutch Ambassador to Moscow. Today, protests and vigils have taken place outside Russian embassies in London and Sydney demanding that the activists are released. A UK petition to the UK Russian Embassy had at the time of writing gathered over 20,000 signatures. This comes at a time where the Greenpeace campaign to protect the Arctic from oil drilling has never been more popular; last Sunday in a global day of protests against Arctic drilling saw protests on bikes dubbed The Ice Ride taking place in 126 cities with over 24,000 participants. Additionally, recently released data shows that the Arctic sea ice melt this year is the sixth lowest ever recorded, Greenpeace believes that protecting the Arctic is at the forefront of dealing with climate change and have made this their main campaign priority. 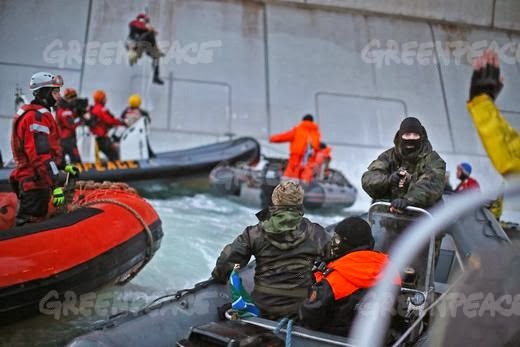 At the time of writing Greenpeace is operating in high alert as Greenpeace offices around the world are pressuring the Russian authorities on getting their activists freed and their ship the Arctic Sunrise released. ← Waste Less Live More Week: How do we stop food waste?